Piriformis syndrome is defined as the compression of the sciatic nerve by the piriformis muscle. The piriformis muscle is an important muscle for lower body movement as it attaches to the outer leg and is used mainly to laterally rotate your leg. Any movement such as walking, or turning, shifting weight from one leg to the other or to even maintain balance, the piriformis muscle is an integral part in these movements. The sciatic nerve is the largest nerve in the human body and its location runs very close to the piriformis muscle either alongside the muscle or piercing through it. Therefore a muscle spasm of the piriformis muscle can cause nerve compression on the sciatic nerve. The sciatic nerve travels down the leg to where it branches out into smaller nerves of the foot. Piriformis Syndrome usually starts with pain, tingling or numbness in the buttocks. 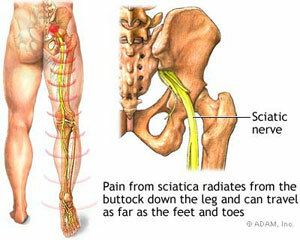 Pain can be severe and extend down the length of the sciatic nerve (often the pain can reach to your feet). Pain could be triggered when going up the stairs, or if sitting for long periods of time. Signs and symptoms of Piriformis Syndrome are very similar to Sciatica in that pain tingling and numbness mimic those of each other. There are orthopedic tests that can differentiate between sciatic and piriformis Syndrome. Direct or indirect trauma to the piriformis such as a fall on the buttocks or a motor vehicle accident. Inflammation or degenerative changes to the piriformis muscle or adjacent joints (such as arthritis of the hip and post hip replacement swelling). Overuse of the piriformis muscle with repeated bending and lifting, forceful rotation with weight on one leg, squatting while holding a weight, or putting down a heavy object. Postural and positional concerns from incorrect sitting position for long periods of time such as one foot driving the car. Decreasing compression on the sciatic nerve and reducing muscle spasm of the piriformis muscle. Reducing pain and removing any trigger points which may be contributing to Piriformis Syndrome. Maintain range of motion of the hip joint. Specific exercises to stretch or strengthen muscles to help reduce compression of the sciatic nerve. If you have any questions about Piriformis Syndrome contact our staff at Dynamic Physiotherapy. How often should I come in for therapy? Each patient is evaluated on a case by case basis. Depending on the type of injury and what stage of healing a recommendation will be made to you by the treating practitioner.